On a beautiful summer's day in 1984, three children go missing in the woods that border their Dublin suburb of Knocknaree. That night, police find one of them, Adam Ryan, clutching a tree, his shoes soaked in blood and with no memory of what has happened to his two friends. Twenty years later, Adam is back in Knocknaree, this time as a detective investigating a murder committed at the edge of these same woods — a case that may be contingent on his ability to remember those misplaced hours from his own dark childhood. 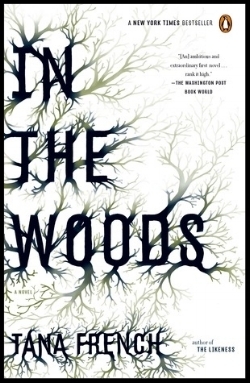 In the Woods is part of the Dublin Murder Squad series. In order, the next books are The Likeness, Faithful Place, Broken Harbor, The Secret Place and The Trespasser. "If you, like me, are essentially a city person, then the chances are that when you imagine a wood you picture a simple thing: matching green trees in even rows, a soft carpet of dead leaves or pine needles, orderly as a child's drawing. Possibly those earnestly efficient man-made woods are in fact like that; I wouldn't know. Knocknaree wood was the real thing, and it was more intricate and more secretive than I had remembered. It had its own order, its own fierce battles and alliances. I was an intruder here, now, and I had a deep prickling sense that my presence had instantly been marked and that the wood was watching me, with an equivocal collective gaze, not yet accepting or rejecting; reserving judgement." Tana French has lived in Ireland, Italy, Malawi, and the United States. Her first novel, In the Woods, won the Edgar Award in 2007 and was followed by several sequels as part of the Dublin Murder Squad series. In addition to writing, French has worked as a stage, film and voice-over actress.